Projects Abroad local partners from Nanyuki with their new first aid kits donated by Irish medical volunteer Annie Doran. Standing beside them are Projects Abroad medical volunteers. When Annie Doran was planning her volunteering trip to Kenya for August 2016, the 26-year-old wanted to make sure that her time in the country would be worthwhile and that she would leave a lasting impact. Annie had volunteered with Projects Abroad before, spending a few months in Tanzania in 2014. She had volunteered on a Medical Project near the town of Arusha and became familiar with the health challenges in rural East Africa, noting that many children lack easy access to basic medical supplies. “A small scratch or cut can quickly become a serious infection,” said Annie, explaining that too often parents and teachers lack basic first aid knowledge. Annie spent several years working as a medical technician on ambulances in Ireland. Her goal was to pass on some of her medical know-how to the local community in Kenya. Annie wanted to donate some first aid kits to the placements in Kenya, but needed to fundraise in order to afford them. Members of Annie’s community in Ireland found out that she was travelling to Kenya as a medical volunteer and asked her to speak at three churches near Dublin. She told the parishioners about her upcoming trip and they responded generously, donating a total of 500 euros. Annie then raised another 200 euros by holding a car boot sale, selling items donated by church parishioners, to raise a total of 700 euros. 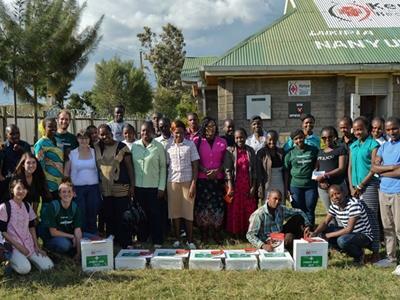 After securing the donation for the first aid kits, Annie travelled from Ireland to Nanyuki, Kenya. Local Projects Abroad staff members then assisted Annie with sourcing and purchasing seven first aid kits and first aid manuals, and organising the medical outreach. These were donated directly to Projects Abroad’s local partners. 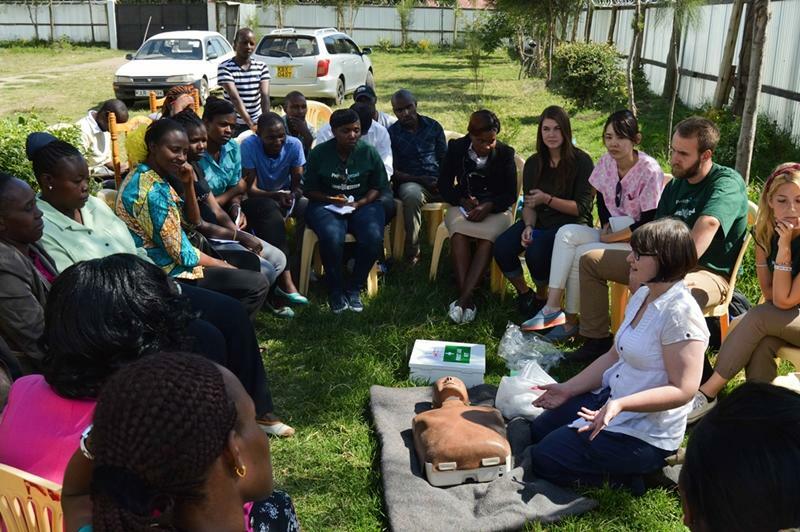 Staff members from the placements attended a first aid training session at a clinic in Nanyuki led by Annie, with other Projects Abroad medical volunteers in attendance from Germany, Italy, Japan and the United States. 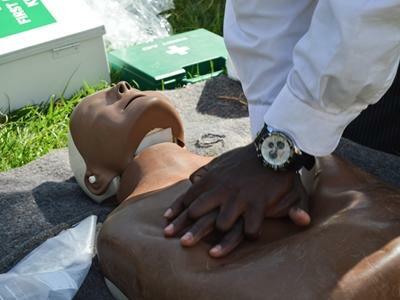 Staff members were taught how to do CPR, correctly approach patients, assess vital signs and apply safety procedures for first aiders. Training also included how to respond to seizures, bleeding, asthma attacks, choking, broken bones, as well as how to place patients in the recovery position. 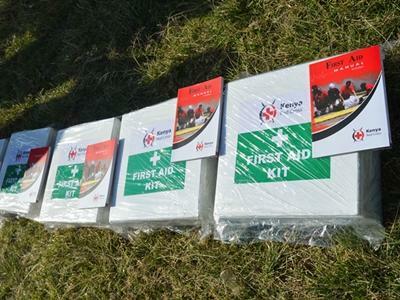 Projects Abroad Kenya Country Director, Olivia Tanui, says the first aid kits and training will be put to good use: “Injuries [can now] be handled more efficiently by trained supervisors, hence this will prevent minor injuries from becoming life threatening,” she said. Annie has since returned back home and plans on furthering her medical studies in Bulgaria. The practical experiences she gained in Kenya will be a great help to her studies and medical knowledge. She hopes the new first aid kits and training will provide safe medical care for the children of Nanyuki in the coming years. Find out how you can contribute to our Medical Project in Kenya or take a look at some of our other Medicine & Healthcare placements around the world.